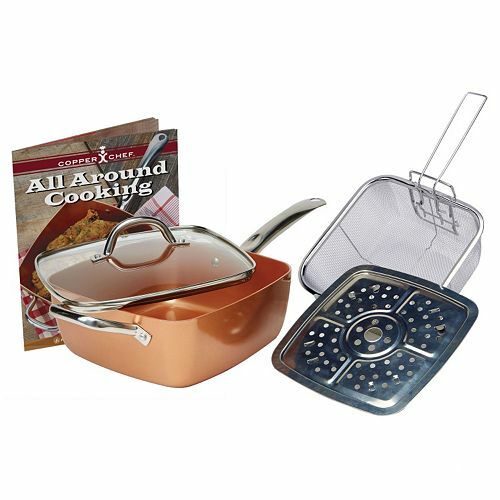 After seeing the infomercial, regarding the Copper Chef, on one of the home shopping networks we were quite impressed with all this pan could do. The special offer was 3 payments of $24.99, which they said was cheaper than usually advertised. Like I said we were impressed so we bought it. A couple of days later it arrived. Quicker than we thought! We were surprised at how thin the metal was and that it did not seem to sturdy, but we wanted to see if it lived up to Chef Eric Theiss's claims. Even before the pan was used for the first time I noticed that the same pan was offered on different shopping channels and Kohl's for a much cheaper price. My fault. We should have searched around! It's been a few months since we ordered this pan and we are not impressed! Food does indeed stick to the pan as we learned when cooking some buffalo wings. Also the pan is actually copper coated aluminum, which scratches off. We still use the pan, since we paid so much money for it, and we will continue to use it for messy frying jobs where we don't want to dirty up our good pans. I would give this pan 3 stars, mainly for the quality offered at such a high price. I would say that similar pans are available for $20 to $40 and that is the most I would pay for copper coated aluminum pans.